The RainbowPUSH Coalition was founded by Jesse Jackson, Sr. when he merged Operation PUSH (People United to Serve Humanity) and the National Rainbow Coalition. It is affiliated with the United for Peace and Justice. The answer to Reagan and Bush is to redouble efforts to build and strengthen the all peoples' front, a vital part of which is the campaign being waged on the issues by Jesse Jackson. The Jesse Jackson campaign is going to force the Democratic Party to speak on issues that they ordinarily would not address. As a political party we do not endorse candidates of other political parties. Communists as individuals work in the election campaign, even in the campaigns of other candidates, not only Communist candidates. I think our members will work for the candidates they think have the most progressive, most advanced positions. At this stage most members of the Party will be working for Jesse Jackson on the basis that he does have an advanced position. But we do not endorse any candidate, including Jackson. In 1988 the Houston Communist Party organized the local Rainbow Coalition. I worked on both the 1984 and 1988 Jesse Jackson for President Campaigns and was an open member of the LRS during my tenure. There was a big difference between the Jackson campaign in ’84 and ’88. In 1984 Jesse Jackson was less of a serious challenger and more of a messenger for progressives, including the African American community, that had seen the Democratic Party backpedal on all the gains of the civil rights movement won in the late 60’s and early 70’s. The new left organizations of the previous decade were mostly still in place during the 84 campaign, with a mass base in unions and communities of color. In 1984, many of the struggles Jesse Jackson was involved in that Bill Fletcher mentions in his “Lessons for today from the 1980’s Rainbow,” were the result of the left’s ability at that time to pull Jesse into struggles and in return give him reciprocal support for his electoral aspirations from places we had a base. For the LRS, this meant striking hotel workers, striking cannery workers, support committees for miners, and visits to Chicano barrios and Chinatowns. On college campuses he visited with Asian Students, Chicano Students in MECHA, and the Anti-Apartheid divestment and anti-sweatshop movements. Jesse Jackson deserves credit for his leadership in embracing racial justice and class inequality, but without the left’s participation, he would not have received the breadth of exposure or the depth of analysis, nor in return receive as broad a reception as he received outside of the Black civil rights movement where he had historic ties. The left, including the LRS, also challenged the lack of proportional delegates Jackson was entitled to at the 1984 Democratic Party Convention held in San Francisco. As luck would have it, the San Francisco Bay Area was the national center of many new left groups including the LRS. As a few of our elected Jackson delegates entered the Moscone Convention Center, thousands rallied outside, demanding an equal voice, based on the votes cast in the 1984 primary. That convention changed the electoral threshold required to gain primary delegates, laying the groundwork for Jesse Jackson to become a serious contender in 1988. It would seem from the in-roads made in 1984 that the left would have had a bigger impact and made more significant gains in 1988, but while Jesse got more votes, the organized left and mass movements were much weaker after the 1988 elections. There were two trends we underestimated or ignored. First, this country was still moving to the right. Reagan easily trounced Mondale in the general election of 1984 and George Bush, likewise, dispatched of Dukakis in 1988. Worse, the Democratic Party was also moving to the right. I agree with Bill Fletcher on the left’s wishful thinking about the Democratic Party’s consolidation under the Democratic Leadership Council, which would usher in the Clintons and later accept Barack Obama. African American Democrats, elected into local office, would follow this trend. For those of us from San Francisco, Assemblyman, State Legislator, and San Francisco Mayor Willie Brown reflects this trend. By the 1980’s, Black mayors and Black municipal elected officials carried out the Democratic Leadership Council’s programs: attacking social safety nets, dismantling affirmative action and implementing the war on drugs, increasing the incarceration rates for Black and Brown people. But the other crucial trend, which many of us in our left bubble did not realize until too late, was that while the right was on the rise throughout the 80’s, our New Left movement was on the decline. There was a big difference in what remained of the New Left between 1984 and 1988. The LRS lasted longer than most, officially dissolving in 1990. By the 1988 elections and definitely by the debate on the Rainbow’s future in March 1989, most of the New Left groups were gone. I didn’t know it at the time but the LRS was also in critical condition. In 1984 I was a cook in a hotel in San Francisco, and an elected rank and file officer of Hotel and Restaurant Employees (HERE) Local 2. I pushed for Jesse Jackson’s endorsement in this capacity and as a delegate to the SF Labor Council. Most LRS members worked this way in some capacity or other. Most if not all of us were unpaid volunteers. By 1988 I was on as a full time paid organizer of the same Local. I got release time to go to work on the Jackson campaign as his Northern California Labor coordinator. I also went down to Houston to work on Super Tuesday. I worked as a full-time paid staff member of his campaign. In 1984, the LRS was not alone in my union local; there were many cadres from various left groups in hotels and some restaurants all over the city. By 1988-89 all those organizations and by extension, their cadres were gone. In 1988, there were more leftist staff in Local 2, including from LRS, but our cadres’ anchoring our base in various workplaces were mostly gone. This was the beginning of the end for the new left organizations, coinciding with the 1988 Jackson campaign, creating the perfect storm. Without a strong mass movement and base, the left is at a disadvantage in a united front electoral campaign Why is this important? I joined I Wor Kuen (IWK), a predecessor of LRS in 1974. We were growing exponentially and expanding across nationalities and geographical areas. As socialists we believed we should be based in the working class. We targeted industries to go into. I could speak Chinese and this added to my ability to organize the majority immigrant workforce. I went into HERE, because I was asked/told to. I held working class jobs as a Teamster, but working in union warehouses was still better than union restaurant work, which was immigrant based work and I was American born. I had done restaurant work in high school and hated it. I swore I would never do it again – until I became a leftist. Besides strategically placing cadre in union industries, IWK also had the line that we could run for elected union office but not take appointed union staff jobs. We explicitly opposed people who had never worked in an industry taking on union staff jobs. By the mid-80’s, we were having a harder time recruiting into the LRS. We changed the above policies slowly. First we started taking union staff jobs, but with cadre who had at least worked in the industry. This coincided with one area of recruitment that had not totally dried up: student work, especially in some of the campuses with an active anti-apartheid movement. Many new recruits in the 80’s came from some of the elite universities. Many factory and working class jobs in the 70’s were filled by student radicals who came off the campuses in the 60’s. The LRS student recruits leaving college in the 80’s would not consider going into factories or low level service work. They did however consider going directly into union staff jobs, work as legislative aides or on campaign work with politicians. They also moved directly into municipal government jobs, another position we opposed in the early days of IWK. We felt it was difficult to fight city hall when you work there. Some members in the national leadership of the LRS, in particular Asians from the IWK, also had ambitions to move on from revolutionary work and their educated backgrounds gave them rapid entre to Jesse Jackson's upper-echelon staff positions. The exceptions they made for the younger cadre of the 80’s on college campuses like Berkeley and Stanford fit in nicely with their own aspirations to move on. Many of the top national and regional staff positions in the ’88 Jackson campaign were occupied by not just members of LRS, but Asian Americans, formerly of IWK. This is one reason we sided with Jackson on the dissolution of the Rainbow into his personal campaign organization in 1989. His top staff members would stay with him, or with his blessing, go into local electoral campaigns of their own. This was not unique to LRS cadre. Many former members of CWP, CPML, LOM, etc. ran and won local offices after the 1988 campaign or got jobs as legislative aids or took positions as municipal bureaucrats. Go here for Rainbow Coalition personnel. Although money was a problem at first, initial backing came from Manhattan Borough President Percy Sutton, Gary, Indiana Mayor Richard Hatcher, Aretha Franklin, Jim Brown, and Ossie Davis. 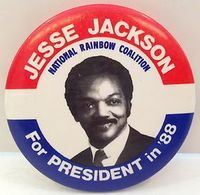 The National Rainbow Coalition (Rainbow Coalition for short) was a political organization that grew out of Jesse Jackson's 1984 presidential campaign. During the campaign, Jackson began speaking about a "Rainbow Coalition", an idea created by Fred Hampton, regarding the disadvantaged and welcomed voters from a broad spectrum of races and creeds. The goals of the campaign were to demand social programs, voting rights, and affirmative action for all groups that had been neglected by Reaganomics. Jackson's campaign blamed President Ronald Reagan's policies for reduction of government domestic spending, causing new unemployment and encouraging economic investment outside of the inner cities, while they discouraged the rebuilding of urban industry. At the 1984 Democratic National Convention on July 18, 1984, in San Francisco, California, Jackson delivered an address entitled "The Rainbow Coalition"..
Democratic Socialists of America did not endorse Jesse Jackson and the Rainbow Coalition in the 1984 election, but DSA did endorse Jackson and the Rainbow in 1988. Shakoor Aljuwani became the DSA staff person working to build support for the Rainbow. His work focused on building Labor for Jackson committees. Louis Proyect first ran into Line of March when he was a member of Committee in Solidarity with the People of El Salvador (CISPES) in the early 80s. They and the Communist Workers Party were the only left groups who worked in CISPES. The CWP, a Maoist sect, was best known for its disastrous confrontation with the KKK in Greensboro, North Carolina in 1979 that left five of their members dead. They had made the mistake of choosing to utilize armed self-defense as a tactic rather than building a mass movement against Klan terror. In 1984 the CWP, LofM and the CISPES leadership decided to support the Jesse Jackson presidential campaign. For Marxists coming out of the CWP and LofM tradition, voting for Democrats is a tactical question. If there was ever any tactical motivation for voting for a Democrat, Jackson’s Rainbow Coalition might meet all qualifications. Many people, including Proyect, hoped that the Rainbow Coalition could develop into a third party but Jackson was too much of a careerist to make the kinds of tough choices Ralph Nader made. One year after the end of the Jackson campaign, the CWP dissolved itself with a number of its members finding a home in the Democratic Party, including Ron Ashford, a very capable African-American who represented the CWP in CISPES. Today Ashford is a HUD bureaucrat. Line of March was heavily involved in both the 1984 and 1988 Jesse Jackson presidential campaigns. At the National Rainbow convention in Raleigh North Carolina, a new board was elected. Overall, Jackson placed third in 1984, with 3.5 million votes, and the pundits who’d said he would be the party’s ruin watched as Walter Mondale, heedless of Rainbow constituents and their issues, crashed in defeat. In 1988, Jackson placed second, winning over 7 million votes, more than Mondale had scored in 1984; and 1,218.5 convention delegates, more than any runner-up in history. Again the pundits, warned of “certain and apocalyptic defeat” if Jackson were given a spot on the Democratic ticket. He wasn’t, and Michael Dukakis, as heedless as Mondale and hitched to Lloyd Bentsen, a DLC Democrat, suffered his own private apocalypse. Privately, one of his close campaign associates said, “I think Jackson didn’t want to have to referee between different parts of his coalition. By 1988 the tensions were already clear. The activists were getting supplanted by the elected officials; the Congress people were telling the lefty radicals to tone it down. The sectarians in various places were trying to take it over internally, and you know the left has never solved that question. We had the most diverse, most little-d democratic, most American delegation anybody’s ever sent to a convention, in ’88. But if we had just had grassroots little-d democratic votes everywhere, we’d have had a delegation made up almost entirely of black ministers, because they could outvote certainly the gay and lesbian representative, the white Central America activists. Some state coordinators are still catching hell for the choices they made.” No doubt, says Anne Braden, “he probably thought he had a tiger by the tail, and maybe he felt he couldn’t control it. But on the Rainbow board, people felt we were doing fine. He needed to trust the people more who really wanted to make it work.” Privately others say Jackson is incapable of engaging in the kind of dialogue and delegation of authority that sustaining that type of organization would have required. Someone else was doing outreach. In the spring of ’89, Al From, intellectual architect of the Democratic Leadership Council, paid a visit to Governor Bill Clinton in Little Rock. Unlike progressive forces, the backlash Democrats recognized the utility of a charismatic candidate, and of starting early. For 1984 they’d won rules changes, introducing the concept of “superdelegates” to shift power from party activists to elected officials. Jackson managed to negotiate limits on those delegates in 1984. The next year the DLC formally constituted itself. For ’88 it advocated one big Southern primary, Super Tuesday, to secure the nomination, it expected, for a white conservative. Jackson swept Super Tuesday, besting the DLC’s favorite son, Al Gore. When Jackson then took 54 percent of the vote in Michigan, what appeared in tantalizing prospect was a new party paradigm–neither the New Deal alliance of Northern liberals, blue collars and Jim Crow, nor post-McGovern liberalism with its smorgasbord of interests and its white elite firmly in charge of portion-control. Party liberals had a choice; they chose reaction. In May 3-6, 1990 the NRC held a successful conference in Atlanta, attended by over 1,000. Bernie Demczuk, national labor coordinator of the Rainbow, organized a contingent. Jack Sheinkman, president of the ACTWU, hosted a labor breakfast. California Assemblywoman Maxine Waters, has been the strongest leader in the California Rainbow, also attended, as did Leslie Cagan, a Rainbow board member. Perhaps it will take the generation behind Obama for that. At a recent conference of Democratic progressives, the younger cohort, more reflective of rainbowism than their elders, were talking about technology but also “beauty parlor/barbershop” organizing; about voter registration but also about using electoral politics tactically, because “our issues don’t go away after the election”; about remembering that “the people need hope” but also regarding the Democratic Party without illusion. The name Kerry never came up. Their issues fell within what Jackson had called “the trilogy of racism, exploitative capitalism and militarism,” what Martin Luther King had first named “the triple evils.” In their 20s mostly, they weren’t quite advocating a “restructuring of the whole of American society,” as King had, but they did speak of imagining a different world. In their discussion there was the resonance of something. According to Mel King there’s an additional factor that figured significantly in Martin Walsh’s successful mayoralty campaign in 2013. Following its questionnaire to both mayoral candidates, the group felt Walsh was more responsive to its concerns. Having encouraged these young adults to do this analysis, Mel King joined with them. At our endorsement announcement, I admired their commitment to looking forward and not wallowing in the past. Honored to be on panel at Chinese Historical Society commemoration of March on Washington — with Francis Wong and Jon Jang at 50th Anniversary of the March on Washington. Jon Jang Steve, you and I were one of the few I know that share how the Jesse Jackson Rainbow Coalition had an impact on the election of President Obama. Moderator Doug Chan, and the CHSA staff Gerard Veronica Sese, Chris Heins, Nolan Chow, Johnson Zheng, Amy Lam. This page was last modified on 5 September 2018, at 23:35.